Two groups of people love trampolines, children and trial lawyers. The U. S. Consumer Product Safety Commission (CPSC) estimates that there are nearly 100,000 emergency room-treated injuries a year that are related to trampolines. Most of these trampolines are in private homes. A quick internet search of the words "trampoline injury" will bring up countless sites discussing the dangers of trampolines. Many sites list consulting a lawyer to be one of the first steps to take when you or your loved one are injured on a trampoline. One of the biggest risks of a trampoline is that you can be held liable for another person's child being injured on your trampoline. This is true even if the child is using the trampoline without your permission when you are not home. Injuries ranging from a broken ankle to paralysis or death have lead to countless lawsuits. If you do decide to get a trampoline, pay close attention to the following safety recommendations from the CPSC Trampoline Safety Alert. Make sure that only one person is on the trampoline at a time. Make sure that no one is attempting somersaults, as direct landing on the neck or back can can cause paralysis. Use shock-absorbing pads to cover the springs and frame of the trampoline. Make sure the trampoline is placed away from trees or nearby structures. Never allow anyone under the age of 6 to use the trampoline. Make sure children using the trampoline are supervised by a responsible adult. 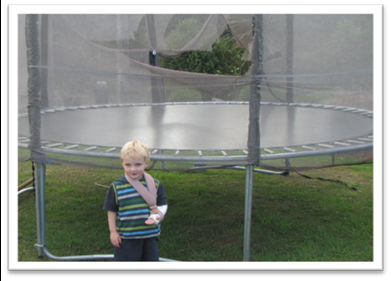 Add an enclosure specifically designed for trampolines to help avoid people falling off.